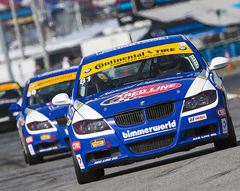 Virginia-based BimmerWorld launched its ambitious four-car Continental Tire Series Street Tuner program last weekend at Daytona International Speedway, coming close to earning a victory in the ST class during the season opener. A late caution period would lock the No. 81 BimmerWorld BMW 328i of Greg Liefooghe and Tyler Cooke into a second-place finish after Liefooghe led in the final stages and was working on moving back into the lead. With the field crossing the finish line behind the pace car, the No. 81 duo settled for their second consecutive runner-up result at Daytona, and with BimmerWorld’s tandem of Kevin Gleason and Corey Fergus holding the No. 80 BMW 328i in eighth at the checkered flag, the team left Florida with a pair of top-10s. “Even though second place is a great result that sets us up with some solid points for the rest of the season, it is a little frustrating to get so close to winning every year without actually being able to get on the top step,” admitted Liefooghe, who ranks as one of the best pro drivers in the series. The other half of BimmerWorld’s entries had a tougher time at Daytona. The No. 82 CRC BRAKLEEN® BMW 328i driven by Seth Thomas and Dan Rogers was drilled out of the race by contact, and the brand-new turbocharged No. 84 BimmerWorld BMW 328i, built on the F30 platform, continued its development program in the heat of competition, which can offer valuable lessons that aren’t necessarily tied to high value finishing positions. As a whole, and with three new drivers comprising the team of eight pilots, team owner/driver James Clay says he’s pleased with Round 1. “I was certainly happy with some of the results for the first event, and more importantly I think we were all very happy with the operation of the expanded team and effectiveness of our new teammates,” he said. “Greg and Tyler drove another solid race and we all wanted the win, and Kevin and Corey came out of the gates strong in their first race with the team. The 82 ran into misfortune with traffic, which always affects a percentage of the field, and the more cars we have, the more likely we are to be involved on a given weekend. With three proven E90-based 328i BMWs and the lone F30 chassis program BimmerWorld is spearheading, Clay sees big growth ahead for the No. 84 car this season. “The BimmerWorld E90 cars are well-developed, but the addition of MCS as our damper technical partner has opened the door to big handling improvements, and we are making good gains there, and there’s more to come,” he added.